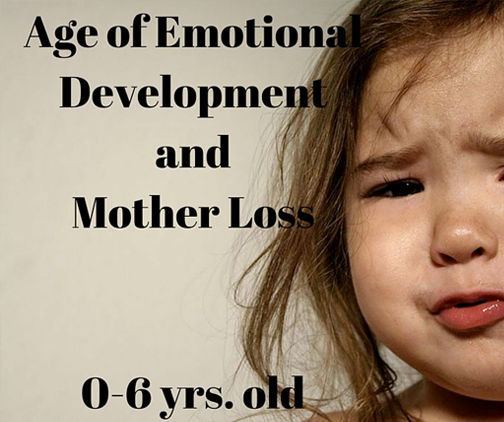 We introduced you to the Stages of Emotional Development and Mother loss in an earlier blog. + Age of loss + Stage of Emotional Development + The ability of our caretaker or support system to allow us to grieve our loss = Long term adult adaptability. In other words, how emotionally balanced, centered, and adaptable we are as adult. Now let’s go forward for those of you who experienced mother loss through death or absence from 0-6 years of age. The major theme for this stage is Trust vs. Mistrust. Experiencing loss in the 0-6 age influences Erickson’s first three developmental stages that are critical to healthy development. Learning Basic Trust Versus Basic Mistrust (Hope) — Major Question: “Can I trust the people around me?” The child, well – handled, nurtured, and loved, develops trust and security and a basic optimism. Badly handled, he becomes insecure and mistrustful. Caregivers who are inconsistent, emotionally unavailable or rejecting contribute to feelings of mistrust in the children they care for. Failure to develop trust will result in fear and a belief that the world is inconsistent and unpredictable. Learning Autonomy Versus Shame (Will) “Can I do things myself or am I reliant on the help of others?” Children who successfully complete this stage feel secure and confident, while those who do not are left with a sense of inadequacy and self-doubt. Learning Initiative Versus Guilt (Purpose) “Am I good or bad?” During this stage, it is important for caregivers to encourage exploration and to help children make appropriate choices. Caregivers who are discouraging or dismissive may cause children to feel ashamed of themselves and to become overly dependent upon the help of others. Success in this stage leads to a sense of purpose, while failure results in a sense of guilt. Click here to read more about the Erkison’s 8 stages of human development. In the Motherless Daughters Ministry, we have collected over 15 years of comments and insights from women related to age of loss and stages of emotional development. Some women, who have experienced mother loss during this stage as a child, translate early childhood loss into being non-trusting as adults. Behaviors range from keeping their true identity closed off, to simply looking like they are control freaks. One woman, who had lost her mother at age 5, said she felt as if she had to do everything herself and others thought of her as controlling. Secretly, her real issue was that she did not trust anyone to do these things. Her controlling behavior was connected to mistrust of others and the loss of her mother at age 5. Here are some other themes related 0-6 yrs. age of loss identified in the book, Motherless Daughters: Legacy of Loss by Hope Edelman. To experience mother loss, a child must first develop the ability to miss someone. This usually occurs between the ages of six months and one year. When a woman experiences mother loss before six months of age, she may feel little connection to the image of the woman who gave birth to her. “I really look like my mother. The pictures I have of her show how similar we are but I cannot get that feeling connection. Should I? I want to. It is just not there.” This woman experienced enormous guilt and stress when other family members pushed her to feel connected to the mother she lost at 6 weeks old. Toddlers can recall visual and tactile images related to their loss. Trauma of separation often illuminates specific scenes or fixes them in their memory. Always looking for a mother. There is a children’s book titled, “Are you my mother?” by PD Eastman (about a bird who after falling from the nest goes in search for her mother). The bird asks many animals and objects to no avail, “Are you my mother?” Eventually the mother bird and the baby are reunited after a long search. Unlike the mother bird in the book, the mother does not return to our motherless daughter and so the daughter constantly goes in search for a mother. One woman shared that she gravitates to women who she thinks can give her what she is missing. She finds herself almost smothering relationships because of this. Her hope is that she can find, in one person, someone who will do all of the things she missed not having a mother. This has fractured or even scared off many new relationships. The same woman also talked about the unfairness she puts on her husband to nurture her in ways she missed. The critical factor that determines how emotionally balanced and centered we are as adults is the availability of a consistent, loving, and supportive care of another adult after losing a mother. This could be a father, grandmother, and older sibling or anyone who is willing to invest in the child’s growth. If you have experienced mother loss from the ages of 0-6, can you relate to any of these themes as an adult? How does this play out in your adult life? Are there ways that you act as an adult that connect with these themes? Share your stories. Would a fatherless daughter experience the same sort of things? Are you aware of an organization that deals with fatherless daughters? Thanks for your question. It does not matter what the significant emotional event that happens at the age of loss and emotional development. It could be father loss or mother loss. The same sorts of issues would present themselves. The mother-daughter connection is so significant that the issues are magnified. The same kinds of reactions can happen with father loss. As far as organizations, I am not aware of a Fatherless Daughter organization. We have been in dialog with an individual who would like to add this to our ministry so stay tuned. Not sure what will happen yet! I would also be interested in a Fatherless Daughter ministry. I lost my dad when I was 5, and much of what I read here applies to my life as well. Please let me know if you decide to start up this ministry. I don’t have any information to share with you yet about a fatherless daughters group but I can tell you it is in the works. As I write, I am relating Erickson to age of mother loss but Erickson is not specific whether it is mother or father. So yes this all should fit for your father loss at age 5. The challenge that some women have shared when they have experienced father loss, they also ended up experiencing mother loss because the mother was emotionally absent. She may have had to take on new responsibilities or may have been so focused on her loss that she was not able to nurture the daughter as she needed. I lost my mom when I was 6. That was 40 years ago. I struggle most every day feeling abandoned and alone. I grew up feeling like I had to be so good so others wouldn’t leave. As an adult I tend to do everything for everyone so I feel wanted and people will stay in my life. I want to trust others and generally I do but then I’m always the one hurt so I immediately revert back to the scared little girl who remembers sitting at her mom’s funeral hoping the preacher wouldn’t tell everyone that my mom was gone because I was a bad little girl. I blamed myself. At 6 I couldn’t process what was going on so it was my fault. As an adult when things go wrong, it was, my behavior that triggered the other person to mistreat me. Losing my mom, has defined who I am today. Thank you for sharing how real this is. Do you realize that this is a act of trust to share this? When we have a significant emotional event like mother loss at this age, it sets us up to begin to load on the developmental tasks for the other stages until the baggage we carry is huge. Knowing how you are triggered back to your age of loss is very insightful. This knowledge can be so helpful because you can now choose how to respond where you become aware. Good for you! I lost my mother at the age of 2 from pneumonia. I can tell you that I long for her..always. I can tell you as much as I want comfort of motherly love from others, I don’t want pity. I grieve silently screaming at the world. I can tell you I will never call no one else mom because I simply never had to say “mom”. I can tell you I get jealous of seeing a mother-daughter bond anyplace I go. I can tell you that when a girl loses her mother at a young age that there is far more heartache then one who loses a father at a young age due to nurture purposes. I can tell you losing a mother at a young age is far more depressing then loosing one at a older age because more moments/memories captured. I can go on and on about how losing my mom at a young age effects me. I am still grieving at age 27. Oh Tiffani, I can feel the hurt in your words! Pity is not what any of us want, and yet when others have no idea of what to say so their words come out with pity. They are simply clueless at how to respond. Loss is so individual and everyone’s story is so different. While it is easy to compare, we can not unless we have been in their shoes. I hear many, many stories of mother loss from all ages. Each one of these stories are painful. I hear your grief look and clear. Are you angry? At 27, your life is just beginning. Loss is part of your past, but it does not have to define your present or your future. You are not alone. There are many women who have experienced mother loss at all different ages. Are you ready to take steps toward your healing? If you think you are, think about the upcoming Journey Retreat, http://www.motherlessdaughtersministry.com/?event=the-journey-retreat&event_date=2016-06-09) on June 9-12. I lost my mother when I was 15 months old. I was just a baby. She was a public health nurse and in the process of sterilizing her equipment, the bottle of alcohol started to catch fire. She took it outside of the ward so as to save the others in the ward. On the way out, the bottle burst and she caught fire. Although I did not know her, I missed her through each of my children’s birth. I missed her every single time I kiss my daughter goodnight because no one has ever kissed me goodnight. I missed her when I had my first period. I missed her when I contemplate my life. I missed her at my wedding. Actually, the pain I have blocked for decades started to resurface in my late 40s and early 50s. I would be driving alone and suddenly the tears would start to fall. I am missing her now, though I never knew her. There was a time when I hated her for saving others and killing herself. It was an intense time and was soon followed by such deep grief and regret of not knowing her. I wish I will eventually learn to heal. Jonette, I am so sorry for your loss. Not knowing your mother and not having her here with you to celebrate so many life events is very difficult. She was courageous and caring; heroic in her actions to save others. BUT that helps very little to ease the pain of your loss and grief. Grief is so cyclic, I am not sure you ever really get over it. It shows its ugly head at the most challenging of times. Kissing your kids goodnight when you miss being kissed. And all of those other events. Be present in your grief, know that it is OK to feel that way. You will heal in the way you respond to your grief. Be connected to other women who get it. In June we will offer a 4 day residential retreat. Think about coming. It could be life changing for you. I have a niece who lost her mother, my sister, at age 2. We have had a pretty good relationship until recently. She’s now 17 and it feels like she’s pushing me away. I’m not sure whether to let go or stay persistent. Any advice is appreciated. I raised 3 boys and am not sure how much acting out is normal teenage girl stuff and how much is due to her very significant loss. My heart breaks for her.